Pool fences and gates fulfill an important function: they secure the pool area, reducing the risk that children or pets will enter without supervision and encounter the threat of drowning. In addition, pool fences and gates—particularly those made of stylish wrought iron—can enhance the curb appeal of your backyard or commercial pool. 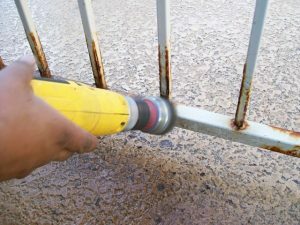 However, these barriers may rust and deteriorate over time as they are exposed to elements like rain, sunlight, blowing dust, and water from sprinklers. Pool barriers at commercial properties are particularly prone to wear and tear because they endure significantly more use than residential pool barriers. If you notice signs of deterioration in your pool fences and gates, it is probably time to have them repaired, refinished, or even replaced in order to keep your property looking its best and your pool area properly secured. Have you observed any of the following problems with your pool barriers? Gates that are failing to open and close or latch properly. As the hinges and latches on your pool gate become rusted and worn down, they may prevent the gate from closing properly. This situation should be resolved immediately because it means that your pool area is not secure—a child could access the pool unsupervised via a faulty gate. In fact, Arizona law requires pool gates to be self-closing and have self-latching mechanisms. A gate that is in disrepair could be just as dangerous as having no pool gate at all! Rusted fence pickets. As the pickets in your pool fence rust and rot over time, they will likely become less stable, allowing the fence to be more easily breached. As with an improperly closing gate, this problem presents an imminent threat to pool safety as the pool area is not entirely secure. Faded paint on the fences or gates. 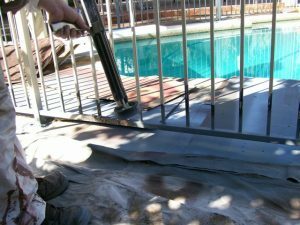 While faded paint and discoloration of the pool fences and gates do not impair pool safety, they are common aesthetic issues that reduce enjoyment of your pool area—which is particularly problematic for commercial properties, like hotels and apartment complexes, that must maintain a positive guest or resident experience. 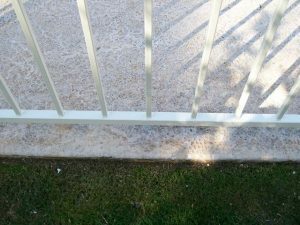 If your pool barriers are exhibiting these signs of wear and tear, it is time to consult the professionals at DCS Pool Barriers! We will begin by determining whether your fences and gates can be repaired or refinished, or whether they are so deteriorated that replacement is the better option. If they need to be replaced, we will design, manufacture, and install new, custom wrought iron barriers to secure your pool area. We use the highest quality components, including premium-grade steel and the safest gate latches available. On the other hand, if your pool fences and gates simply need to be repaired, our team of skilled technicians will restore them to a like-new condition for maximum safety and aesthetic appeal. We use the latest technologies, such as electrostatic painting and galvanization. Electrostatic painting is a highly efficient method of paint application that uses charged particles in order to seamlessly adhere paint to objects of any shapes or styles. This results in a smooth, even finish that will stay in prime condition for years to come. Galvanization is the process of sealing wrought iron with a protective zinc coating to safeguard against rust. Galvanized wrought iron products from DCS Pool Barriers carry a ten-year warranty. After making the necessary repairs, our team will ensure that all components are functioning properly, compliant with state and local regulations, and complementary to the style of your property. Noticing any signs of deterioration in your pool fences or gates? Don’t risk the safety of your pool area—contact DCS Pool Barriers today at 623-825-7700 for a free estimate!